Grades of Green Youth Corps students and brother tag-team Ismail B. and Umar B. kicked off No Idle Zones at Woodbury Elementary school to educate drivers about the importance of turning off car engines in school pick-up lines. 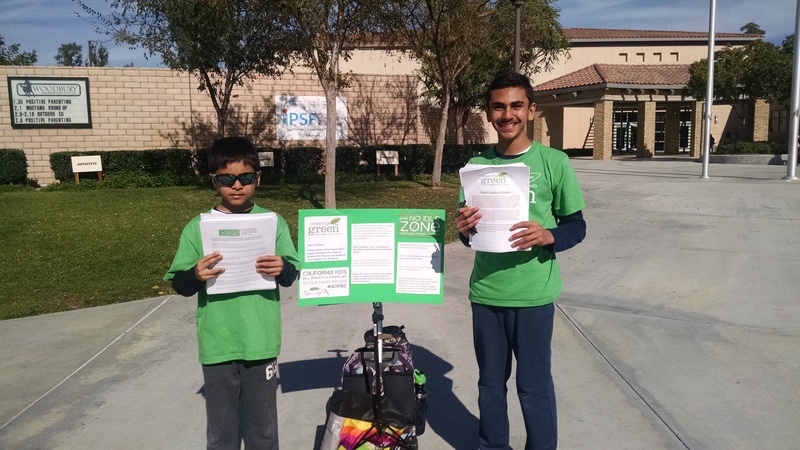 Inspired by the passing of ACR 160, Umar and Ismail were excited to introduce Grades of Green's No Idle Zone Activity to their school community as there are three parking lots on campus that are filled with cars at the end of each school day. The duo started by explaining their idea to the principal, and after receiving his support, they provided each teacher with information on the impact of idling on our planet. From there, Umar and Ismail created educational posters and flyers, and hosted a two day campaign at school to educate their community about the impact of idling in the school parking lots. The Activity has been a huge success; congratulations Umar and Ismail! Interested in implementing No Idle Zones at your school? Grades of Green is excited to host our first webinar, which will focus on the No Idle Zones Grades of Green Activity. All educators, students and volunteers are welcome to tune in! The webinar will take place on Wednesday, February 22nd, 2017 at 3:15pm. To join the webinar, check out our Facebook page as we will be broadcasting from Facebook Live! The first 20 schools that join the webinar and take on our No Idle Zone Activity here will receive a FREE No Idle Zone banner to display proudly at your school.